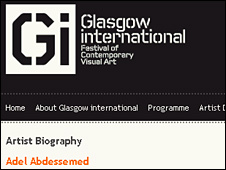 Footage of animals being slaughtered with sledge hammers has been turned down by the Glasgow International (Gi) contemporary art festival. The work by Algerian artist Adel Abdessemed was withdrawn from a gallery in San Francisco at the weekend after staff received death threats. The artist argues it is a routine procedure in rural Mexico and he simply filmed it as part of his work. The biennial Glasgow International showcases the best in modern art. Other pieces of work by Adel Abdessemed will come to Glasgow, but Don't Trust Me, which shows scenes of food production in Mexico, was offered to Gi but was rejected. Curator Francis McKee told the BBC's Newsnight Scotland programme: "I think it was meant to be quite a complex statement about a relationship between the west and the east." Mr McKee said he hoped there would be no adverse reaction to the showing of the artist's other work, after protests by animal rights campaigners in the US. He added: "It's not meant to be sensational, the other work isn't particularly sensational in that sense. "If it's taken out of context then it's very easy to make it sound as if it is, whereas he's actually documenting something and trying to talk about very deep issues." Mr McKee said the artwork, and a piece also in Gi about murdered Polish student Angelika Kluk, were more about raising challenging ethical questions than seeking to shock.